Moissanites are gaining traction in the jewelry world as a popular diamond alternative. For the untrained eye the difference between a moissanite and a diamond is nearly impossible to see. Here are some other interesting facts about moissanites you should know when considering one for your engagement ring. It was discovered in the US. Dr. Henri Moissan discovered moissanite in 1893 inside a meteorite creator in Arizona. Though at first he mistook the crystals for diamonds, they would later be identified as silicon carbide. Moissan made it his life’s work to recreate the rare gemstone and years after discovering the naturally occurring stone he was awarded with a Nobel Prize in Chemistry. Naturally occurring moissanites are very rare. Moissan had only discovered small particles of the moissanite mineral and only in very small varieties since then. Their incredible link to meteorites and pre-solar grains (otherwise known as stardust) makes them a truly out-of-this-world gemstone. 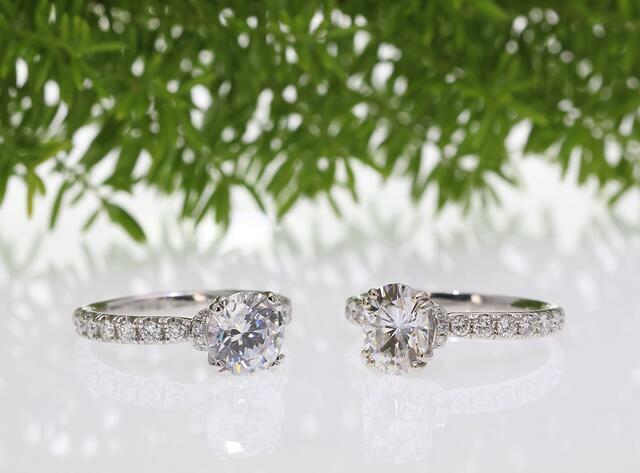 Lab-created moissanite is made to be similar to diamonds. The hardness, optical and thermal properties of moissanite made it a worthy competitor for diamonds, but because of its rarity efforts needed to be made to synthesize the mineral in order to use it for industry and commerce. Its brilliance and optical similarity to diamonds is why it has become a popular choice for engagement rings. Lab-created moissanite on the right. Moissanites are an affordable diamond alternative. Lab-cultivated minerals of all types prove to be more affordable than their mined counterparts. They are 90% less expensive than a conflict-free diamond and 70% less than a lab-created diamond, yet the characteristics are nearly the same. Moissanites are not graded on color. Smaller moissanites can look colorless, but larger ones will have a yellow or greenish hue depending on exact size and lighting. The same can be true for diamond colors and size. However, it is possible to find moissanite that is nearly colorless. Interested in exploring the world of moissanites for your engagement or wedding ring? Our certified gemologists are here to help. What's a Clarity Enhanced Diamond and Should You Get One? All images and information contained within this website are the proprietary materials of Icing On The Ring © 2019. No information or images may be reproduced in any shape or form without the express written consent of Icing On The Ring.